Straight Outta Compton is an intriguing film that comes on the back of much critical acclaim and whilst it is an entertaining biopic charting rap group NWA, it is hardly a game changing movie. The film, as you’d expect from listening to the music of NWA, takes a huge focus on racial issues, particularly at the start when the audience is thrown straight into 1980’s Compton. Here we see the struggles of a young Ice Cube (Oshea Jackson Jr.), Dr. Dre (Corey Mitchell) and Eazy-E (Jason Mitchell) being harassed by the police and arrested for doing nothing, whilst also being threatened by local gangs for a similarly lack of reasons. The three of them turn to music as a way to explain their situations and despite protestations of the police and FBI soon find themselves with a record label – with help of manager Jerry Heller (Paul Giamatti in what is now a typical role for him). However fame and fortune take their toll as the band turn against one another in a tense and dramatic film. I guess the biggest reason why people are praising this film is for its realistic and honest feeling portrayal of the characters of the time. The key characters do not feel glorified (although they are probably are) as we see them all commit crimes and regularly fight. We are however given a reason to genuinely ‘F**k tha police’ through a series of brutal arrest scenes that help showcase the problem of police harassment and racial stereotyping (problems that still exist today). The first hour and a half of the film is amazing to watch and totally absorbing cinema as great performances really bring depth to the characters and a range of interesting scenes keep the audience on their toes. The last hour of the film however changes as the characters achieve success and become arrogant, turning their anger away from the big issues and towards each other. The film then becomes tiring, drawn out and predictable which is a real shame as up to that point it feels as if its really going somewhere. The introduction of other rapper-characters such as Snoop Dogg and Tupac also feel pointless as the film starts to feel more and more like an advert for Ice Cube and Dre’s talent – with references to Beatz headphones and Ice Cube’s early films coming across as out of place and a little pretentious. The film also skips over many of the darker moments in their personal lives, particularly that of Dr. Dre with his infamous attack on Dee Barnes skipped entirely. It just feels like its attempts to be an honest account could only stretch so far and the exclusion of such a scene tarnishes the integrity of the rest of the movie, which is a real shame. Straight Outta Compton is a film which isn’t undeserving of the acclaim its receiving but for me could have made a bigger statement. Steve Jobs is a film split into three segments that tells the story of Apple’s co-founder at the product launches of three products in 1984, 1988 and 1998 respectively. Filmed in close to real-time the film leaves a lot open for audience interpretation and provides little back-story to the characters. It makes the assumption that those watching have at least some basic knowledge of Steve Jobs (Michael Fassbender) and his relationships with Steve Wozniak (Seth Rogen) and John Scully (Jeff Daniels). From the opening segment at the launch of the Macintosh we are thrown into the deep end and witness the hectic events as Jobs struggles not only with the launch but also personal problems revolving around his daughter. This relationship and Job’s poor attempts at fatherhood are to become the emotional core of the film, which chooses to focus almost solely on the character rather than his life story or the technology for which he was famed. Without a good actor it would have been simple for the script to turn into sentimental rubbish as much of the dialogue focuses on Jobs’ insecurities. Fassbender however proves to be the perfect choice as he takes on the icon and brings all the eccentricity to life in a wonderful performance. Through each segment he adjusts his performance just enough so you can see the effects of time on the character; but not so much that it feels like a different person. Although the change from a tense suited Jobs in 1988 to relaxed jumper wearing version in 1998 is pretty jarring at first. The best thing by far about the film is its ambiguity over Steve Jobs and it’s keeping in the grey area as to whether he is a jerk or a genius or both. Throughout the film we get to witness examples of each as the high pressure situations of the product launches provide allow the perfect opportunity to build fantastically tense sequences. Steve Jobs is a far from perfect or historically accurate view of Jobs’s life but one that makes for tense and interesting entertainment. Beasts of No Nation explore civil war in an unnamed African country, it has a strong message about the perils of war that it tries hard to put across but fails to do so through a lack of bite and horrific scenes that have no effect on a modern desensitised audience (or maybe just me). Beginning in a small time we are introduced to young Agu (Abraham Attah) who lives in a small town trying their best to avoid the war ongoing around them. This proves impossible and when the war arrives Agu finds himself recruited to a army battalion commanded by a threatening Commandant (Idris Elba). Agu finds that his childhood is over as the Commandant turns a frail child into a merciless boy-soldier. The film tries hard to shock the audience with its portrayal of the brutality of war – it is a film filled with ungratutious – but still gory – deaths and there are several scenes in which characters morality are questioned. However it doesn’t offer anything new to truly shock an audience into action. The entire thing feels exactly the same as any other war movie and whilst I’m sure an audience knows that war is a terrible thing the film does little to increase the awareness of this fact. Modern day cinematic audiences are used to seeing death on our screens, often in a comedic fashion, this makes it difficult for a director to shock us with brutality as we’ve seen it all before and it just doesn’t feel as real as perhaps it should. Everything that’s good about of this film comes from the performance of Idris Elba or his interaction with other characters. From his first appearance Elba dominates the screen with a fantastic prescence and proceeds to drive the film forward in a truly wonderful performance. There’s been much talk about his snub at the OSCAR’S and I can see why as it is an extremely memorable performance and role. The most interesting thing about the film though is its decision to not name the country the war is happening in. This adds an element of intrigue and also helps showcase that this sort of war is a typical thing around the world and should be stopped… we also never find out who exactly Agu is fighting for and whether he is on the good side or the bad side. It seems as if everyone is killing each other for no real reason. The film also introduces politics and the UN towards the end a politicians line ‘This war is about public image now’ is one of the few lines to really send the films message across. A film which tries its best to provide something new, but misses it mark and is ultimately all too familiar. Spotlight is a film that will most likely win the Best Picture at this years OSCAR’s and although it would not be my personal choice it is easy to see why; as it ticks all the boxes that the Academy love. 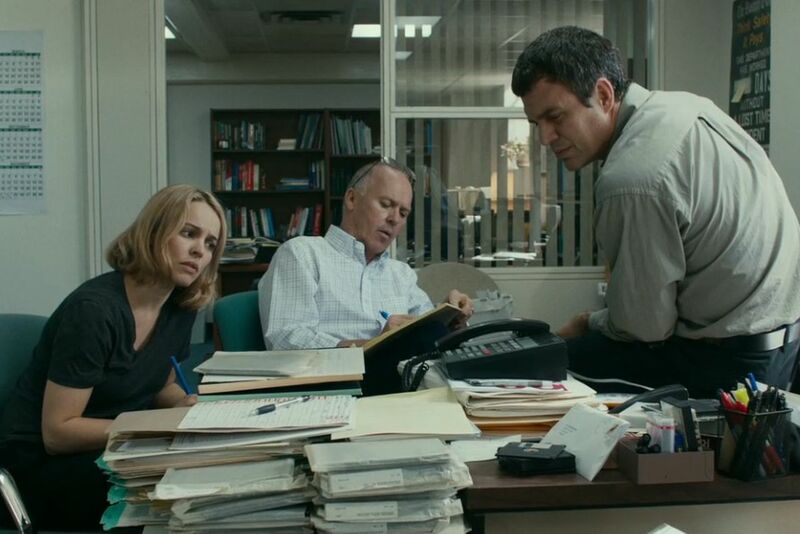 Based around a group of investigate journalists (played by Michael Keaton, Mark Ruffalo, Rachel McAdams & Brian D’Arcy James) known as Spotlight, the film follows the uncovering of the still shocking story of child molestation within the Catholic Church. We get to see the case as it slowly unfolds and feel the reactions of each of the characters as their faith is shaken by the amount of corruption. The film is fully focused on the story of the journalists – it doesn’t get bogged down by sentimentalism and allows the horror of the situation they are discovering to speak for itself. This only makes the it more dramatic; the fact that we don’t see any of the characters lives outside of their work (apart from the small areas where the two cross over) is also refreshing and allows the focus to remain where it should be. All of the performances by the cast are entirely naturalistic and believable (if not spectacular) as they act and speak the way real people would in their situations. This again adds to the drama of the film and also helps to make the story relatable in the sense that the molestation could happen to anyone. Ruffalo being the standout performer. For all its good points however the film falls down on the fact that it’s story is too thin. Looking back on the film you can see that the “investigative” journalism the characters performed was simply looking through some books in the basement and getting hold of some legal documents. Apart from that the film is essentially just interviews with victims of the crimes and characters reacting. Yes it does handle what is a sensitive subject with delicacy and remains to true to what actually happens but their just isn’t enough content to carry the film for its two hour length. Spotlight is a good film which ticks all the Academy’s boxes but offers little to a general audience. In five years Spotlight will have been forgotten by the mass population and is a film that only those interested in best picture winners will watch. And if it fails to win Best Picture then it will in all likelihood be forgotten completely. 45 Years is a slow-building, emotional drama that raises thoughtful questions about the past and it’s affect on present day relationships. Kate (Charlotte Rampling) and Geoff (Tom Couternay) have been happily married for years… in fact their titular 45th wedding anniversary is approaching as the film begins and they are looking forward to celebrating it. That is until Geoff receives some terrible news that stirs up memories of his life before Kate and threatens all their years of love. The film keeps everything incredibly simple. Be it bare and bleak set design, the long perfectly framed shots or the subtle performances. The film is a marvel of proper filmmaking… everything seems to be done for a reason and only adds to the films coldness. The performances of the lead cast are wonderful. Although at the start of the film it does feel like Rampling is over-acting a little and all her movements seem a little forced as the film progresses so does her performance, which during the final scenes is mind-blowing as she conveys more through a look on her face than any dialogue can. Courtenay takes a more subtle approach as his has a backseat throughout the film, stepping forward to show his skill at key points in the wonderfully written script. 45 Years offers such a bleak reflection of reality and relationships that is, at time, hard to watch. There is nothing in the film to be happy about and it’s depressing, reflective mood is infectious to those watching. It leaves an audience in a bleak mood and lingers in your mind for long after. If anything it’s depressing outlook is too much and it leaves you wishing for a glimpse of joy. 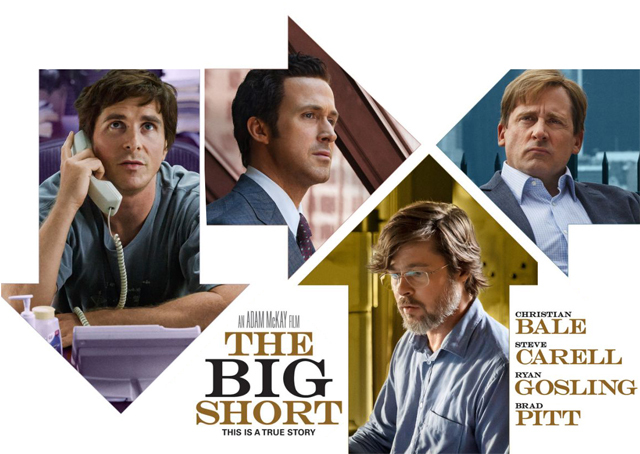 The Big Short provides a sleek, witty look at the housing market crash of 2008 from an unexplored angle. It’s a stylish, somewhat bizarre yet also thoughtful movie that keeps what could have been a boring drama fun. Some of the most popular words in the films screenplays are technical bank lingo such as: mortage backed security, sub-prime loans, collateralized debt obligations (CDO’s) and credit default swaps. These terms have little meaning to those who are unfamiliar with the world of banks, brokers and Wall Street and it’s conceivable that the consistent use of such phrases could alienate an audience. 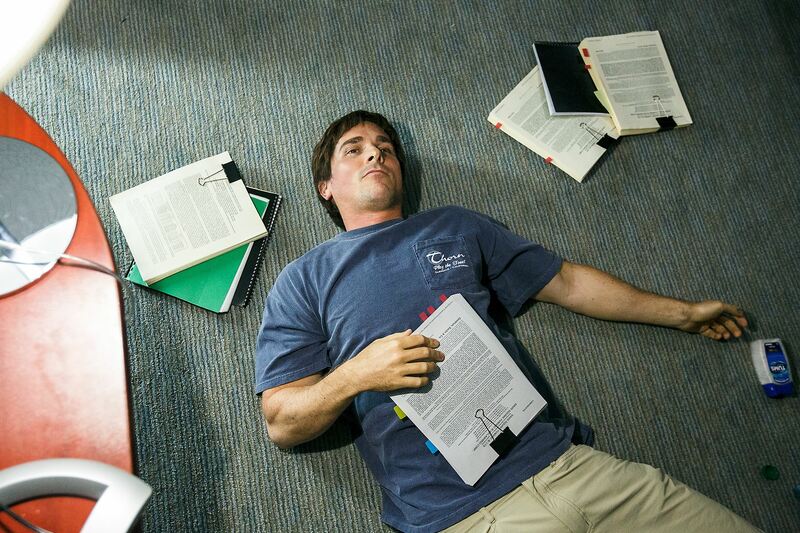 Luckily The Big Short doesn’t suffer from these problems. With a great cast, story and Margot Robbie drinking champagne in a bubble bath turns the film into a quirky ‘heist’ movie that has raises huge questions about corruption. The film focuses of four different groups of ‘outsiders’ who profited from the collapse of the banks in 2008 by betting against the solid housing market; these people where the few who realized what was happening and what would happen and took advantage of it. Amongst these are the heavy metal listening genius Dr. Michael Burry (Christian Bale), the straight-talking irate Mark Baum (Steve Carrell) and a small part for the eco-friendly seed obsessed Ben Rickert (Brad Pitt). All of the characters are fantastically entertaining and performed in such an absorbing way that you are sucked into the film (which at times is almost documentary-esque). The focus on each character’s quirks however fails to make them truly relatable and during the final act they become a little one dimensional – for example Brad Pitt has an emotional rant about how ‘millions will lose their homes over this’ feels extremely forced and out of place. The sub-plot of a personal tragedy in the past of Steve Carrell’s character feels similar off-tone and has no viable reason to be included. The film though covers for these problems with its fast-pace and witty script; which gives each actor – including the non-A-listers such as Rafe Spall, Jeremy Strong and John Magaro – their moment to shine. For a film with such a large ensemble cast it does a great job of spreading the story between them. For all its humour the film also does a fantastic job of spreading its message about the big banks and the corruption within them. Towards the end of the film the focus shifts onto the scale of what the characters are doing and the moral ambiguity of such. Even though each of them becomes millionaires none of them are happy about it; their celebrations muted by a sombriety that makes the message clear. 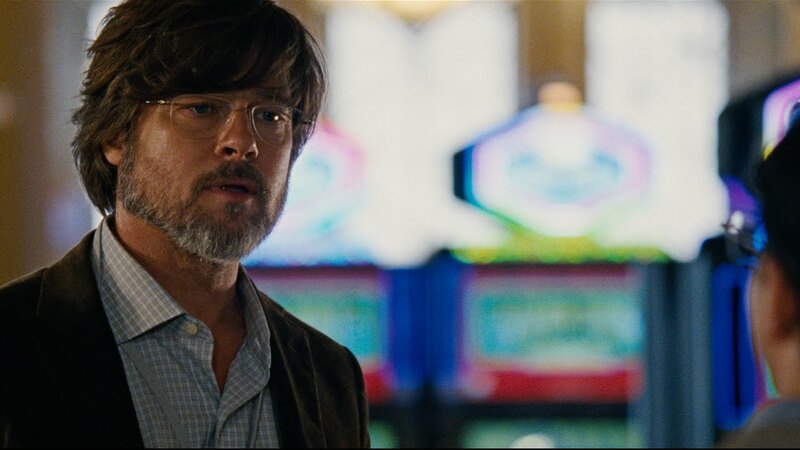 As only the best films do, The Big Short, makes the audience feel happy yet also thoughtful at its conclusion and it takes a while to come to terms with exactly what happened and the impact on the economic crisis on us all. Billy Wilder’s classic best picture winner is a wonderful movie that only gets more interesting when seen multiple times. Having recently decided to re-organise my Top 20 of all time movie list; I found myself stuck in a dilemma. For the sake of fairness (and to stop Hitchcock from having all 20) I made the decision that only one film per director can make the list. Some decisions here where made easily for example choosing Big Lebowski as my favourite Co-en Brothers movie or Pulp Fiction as the best Tarantino work. Choosing my favourite Billy Wilder film is something of a problem – how do you choose a favourite from some of the finest and most charming films ever made. After much internal debate I finally whittled it down to two films The Apartment (1960) and Some Like It Hot (1959) which I both think of fondly for very different reasons. I then realised that having not seen either in other a year it would be unfair to judge them solely on my memories of their charm and much easier to just watch both and see which I prefer – my review of Some Like It Hot will be next in my Film-A-Day challenge. The Apartment was the first Billy Wilder film I ever watched. 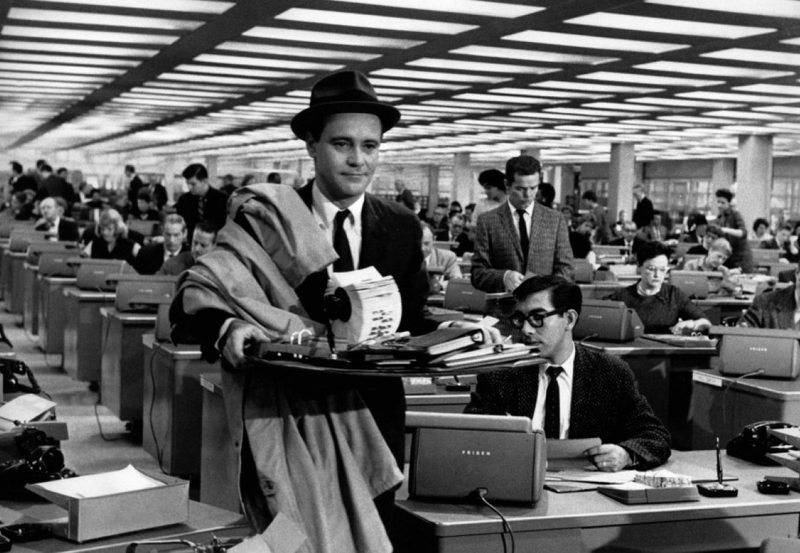 I remember watching it for the first time and being blown away by it’s witty, charming yet surreally dark portrayal of New York and its satirical look at office work, consumerism and love. I was instantly obsessed with it (this was probably helped by the fact that I watched it during my Fight Club phased and would’ve adored any film with a vaguely anti-corporate message). Since then I have watched the film several times and it has always stood up to its expectation. I was therefore excited to revisit it yet also filled with anxiety as to whether it would stand up to my ever changing and increasingly judgmental opinions. As soon as it with its C.C Baxter (Jack Lemmon) statistical analysis of New York life, all my fears where quelled as I became absorbed in the film and immersed myself in the wonderful world that Wilder creates. Everything in the film is immense from its perfectly crafted screenplay; it’s excellent pacing and the beautiful set decoration. From the second we meet Lemmon we know the character and instantly like him – the-bumbling-nice-guy-who-can’t-say-no may be an archetypal character but that doesn’t mean you can’t love him. Lemmon’s performance dominates the screen and the audience feels throughout the emotions and chaos of the journey on which he goes. The best part of the film though by far is its balance between comedy and drama; whilst the film is not the laugh-fest I expect when I watch Some Like It Hot. It is full of fantastic comic moments that are genuinely laugh out loud funny; with most of these coming from Baxter’s almost blind optimism. Taking this optimistic character and contrasting him with a down-on-her-luck pessimist Frank Kubelik (Shirly MacLaine) an equally great character and performance creates a beautiful dynamic in the film that makes the emotions felt by the characters and the audience towards the end of the film all the stronger. It is masterful. The film does what very few films are able to do; it offers up a platter of mixed emotions and leaves you feeling emotionally tortured. After watching the film I couldn’t decide if I was happy or sad… it was sort of uplifting but in a strange sort of way. Such was my investment in the characters and that I couldn’t quite decide if I was happy the way things turned out; the ending has a slight tone of ambiguity to it that leaves you wanting more and questioning not only the film but also your own life. A film which I adored previously and reaffirmed it’s adoration; the Apartment is a firm favourite of mine and it will take something special for Some Like it Hot to beat it to my Top 20. Leonardo Di Caprio gets knocked down (and gets back up again) dozens of times with an epic performance in a film that is violently thoughtful. 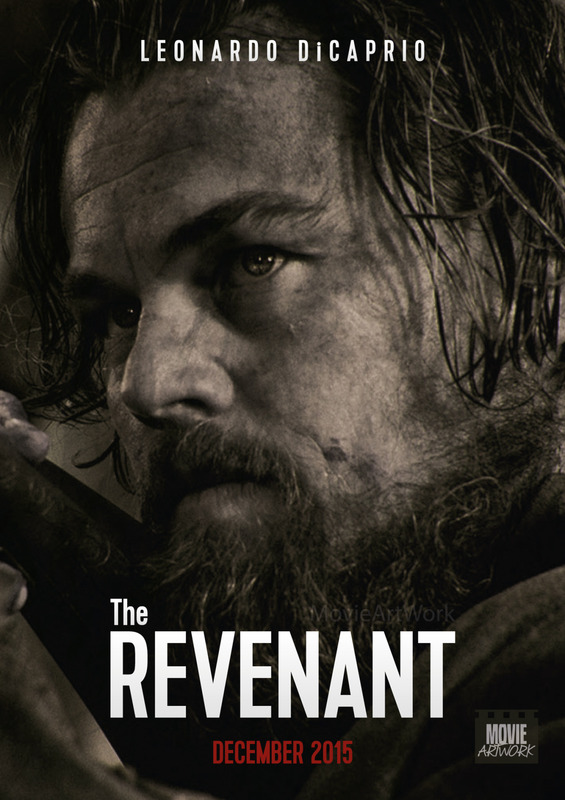 Be it the various production problems or Di Caprios supposed certainty at winning his elusive Oscar, Revenant is a film that has been talked out about to an extreme amount. The problem is all the chatter is for the wrong reasons; and it’s only after you set all that aside that you can enjoy the film. The film looks wonderful with every frame giving the audience some sort of natural beauty to glimpse at. It is truly astounding from a cinematographic standpoint and worth a watch just for the camerawork. Following Hugh Glass (Di Caprio) who is left for dead after being mauled by a bear; the film is a revenge tale as Glass fights off certain death and travels miles gravely injured in order to get revenge on Fitzgerald (the southern-accented Tom Hardy) for killing his son. In order to reach Fitzgerald he must cross hundreds of miles of snowy mountains but Di Caprio is not one to let a cut throat or falling off a cliff get in the way of his OSCAR dream Glass is not one to let a cut throat or falling off a cliff get in the way of his revenge and perseveres to an extreme. The will of the character, the actor and the performance is startlingly good. The problem is that Di Caprio is so obviously Di Caprio throughout that it’s distracting. You never have a chance to relate to the character because of the pre-conceptions with the actor; and with little to do other than grunt, groan and sleep in a horse carcass it is easy to see why. The commitment to the role is never in doubt; the problem is the role itself. It is hard for any actor to show themselves in all their glory when the majority of the role is to be in extreme pain. The film even ends with Di Caprio staring straight into the camera in what can only be seen as a plea to the academy voters – and the thing is it could work. The violent scenes are perfectly directed, as they do not fall into the easy trap of becoming either horrific or comedic – instead they remain gory and cringeworthy. You are never too put off by them, even if the middle portion of the film that is just a series of set pieces aiming to shock an audience. The final act of the film is wonderful as the tension mounting throughout the journey comes to a head in a beautiful cat and mouse moment between Di Caprio and Hardy. It is amazingly choreographed and chilling to watch. Revenant is a film that does what you expect, you see Di Caprio fight a bear and then you see him suffer. You see Tom Hardy put on another ridiculous accent. It is enjoyable without offering new. A film that is trying too hard to win awards… but will probably win them anyway. A wonderful drama split into two distinct halves that are captivating, enthralling and tear-jerking in equal measure. The film follows Joy (Brie Larson) a girl who was kidnapped and held hostage in a highly secured garden shed which she refers to as ‘Room’. In Room she gives birth and raises a child Jack (George Tremblay). Jack, who is five at the time the film is set, has no understanding of the outside world other than the images he has seen on TV and a large part of the film is about his adjustment to reality. The first half of the film is an emotional thriller about the two characters being trapped inside Room. Every second of this is filled with tension and drama as we are thrown right into the situation and are able to see the world from young Jack’s eyes as he tries to comprehend the situation he is in. This half gets you on the edge of your seat and keeps you there as you try and figure out how and if the characters will escape this awful situation. Then the film shifts tone as we see the psychological after-effects of the kidnapping and discover reality, as a child would see it for the first time. The thriller element of the opening half drops away and leaves us with a pure emotional drama centered on characters we truly care for. The change works wonderfully and you leave the film in a state of poignant thoughtfulness, the events and emotions remaining with you for some time. Much of the emotion comes from the fantastic performances by both Larson and Tremblay. Tremblay given his age and the role he was asked to play is simply astounding as you feel every emotion he does and truly believe that is how a child would react in his situation. This film is just wonderful to watch in every sense. 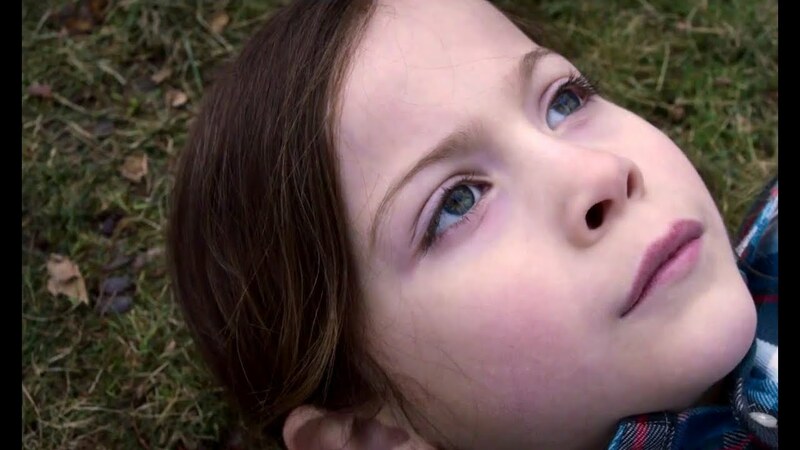 Room is a wonderful film that even if it doesn’t wind up winning the Best Picture Oscar (which from the nominated films I’ve seen so far it should), will stand the test of time and remain in the memory of every viewer for a long time afterwards. 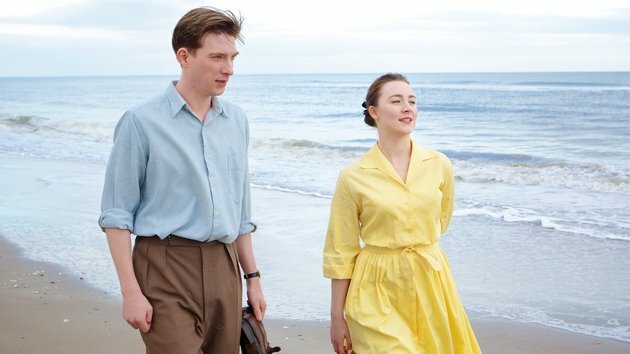 Brooklyn is a period film, which perfectly encapsulates the experience of Irish immigrants in post WWII America. Unfortunately the realism that the film aims for is overshadowed by an obsession with America’s greatness. The film is almost entirely realistic in both look and feel; it does a great job of guiding the audience back to both 1950’s Ireland and America and everything about it is entirely believable. The film has no real story (until its final act) and is amazing for this. Part of the realism that makes the film charming comes from following a character who doesn’t particularly have any goals and is simply there because she can be. This gives the audience a great chance to witness a refreshing vision of New York. This character, a young irish girl Eilis (Saoirse Ronan) is wonderful to watch and is written and performed in such a fantastically subtle way that it sets the pace and tone of the entire movie. Everything that’s good about the film comes from Eilis’s journey and the performance of Ronan is utterly astounding throughout. Despite Ronan’s performance and some beautiful set design the film becomes rather annoying at points… mainly because of its seeming obsession with America and the American dream. The message of America being the land of greatness comes across far too strongly in the film (particularly at the start and the end) and it just kills the vibe. The most obvious example of this comes near the start of the film when Eilis first arrives to America; after passing immigration she is able to step through a door onto American soil. When she opens the door all she can see beyond is white light into which steps. It is all just too much. 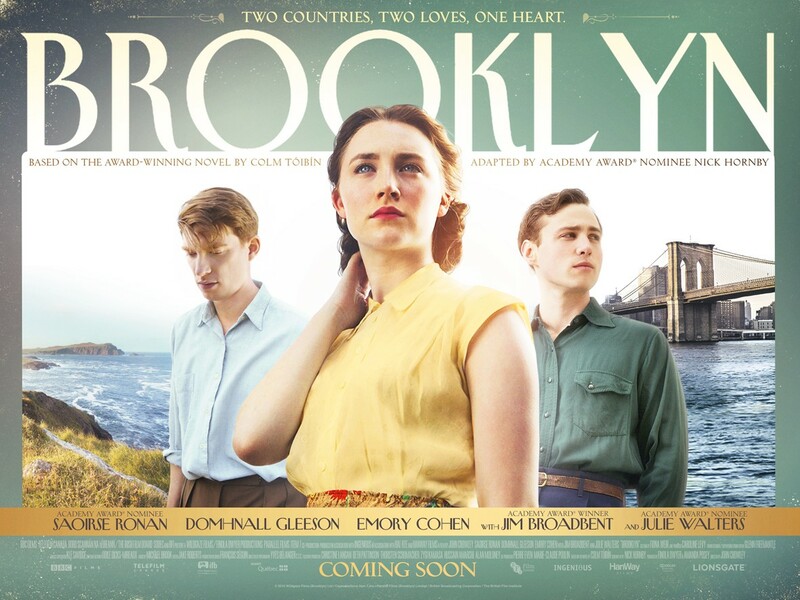 The film also decides to gloss over several issues of the time in order to focus on Eilis’s life; and also which conveniently would mean portraying Brooklyn in a negative light; the most glaring of that of sexism. A key point of the film is that Eilis’s has a dream of being an accountant and thus starts studying bookkeeping. She is the only female on her course and all of her male classmates accept this without fail and some even ask her for help. I’m no historian but I struggled to believe that this would have happened, as far as I know males of that period where often scared of strong women and would most likely have made rude jokes and cajoled a woman on such a course. The films decision to gloss over something as important of this just feels a bit disrespectful to the woman who did suffer such in real life. For every great thing about this film there is a fault. It is a wonderful film and I’m sure if I had a bigger obsession with America I would love it. Unfortunately the USA is not the country for me.